E nga mana, e nga reo, e nga karangaranga o nga hau e wha, tenakoutou katoa. Ki nga mate huhua o te wa nei moe mai koutou, moe mai ra i te kainga tuturu mo taua te tangata i Hawaiki nui, Hawaiki roa, Hawaiki pamaomao i te hono i wairua. Koutou nga mate ki a koutou, tatou te hunga ora ki a tatou, heoi ano, tena koutou, tena koutou, tena koutou katoa. The Rongotai College Whanau Support group is a voluntary group of involved parents who meet once a month to discuss and plan the promotion and recognition of Rongotai College’s Maori students and community. Since the inception of the Whanau Support Group in 1991 the main purpose has been to assist in Maori related activities both curricular and extra-curricular to promote a sense of Maori identity and unity within the college. Acknowledgement must go to the successive Boards of Trustees and Whanau Support members in the past who have since “carried the light” of making sure our college has a Wharenui, a traditional Maori learning space for the Rongotai College community and that offers a Turangawaewae (a place to stand) for all of us. The wharenui now stands at the front gate and the carvings being an approprite mix of contemporary and traditional, is a significant part of Rongotai College’s shift into the 21st Century / modern New Zealand. The wharenui has seen the unifying of parents from the communities of Rongotai College and its sister school, Wellington East Girls’ College. 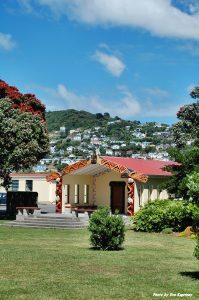 The wharenui, being the first carved meeting house in the eastern suburbs, is a significant place for the Maori language students and the kapa haka group comprising students from both colleges. Whanau meetings are held regularly in Tangi Te Keo (the wharenui). Topics discussed range from fundraising, student progress, national statistic information, support within the school community, moving forward… anything and all things! It’s always good to have new faces attending.